Handcrafted Wooden Toys, Decor & Home Goods. Beautiful Wood Turned, Shaped & Sanded to Enjoy. Call me sentimental, but I love coming across creative teams that are partners in life and in their art. 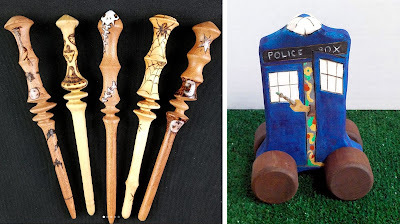 One such adorable duo is husband and wife Terry and Sarah Snow who collaborate to make one-of-a-kind wooden sculptures. Through their business Chaos Woods, these two offer a wide variety of home goods, both beautiful and functional. 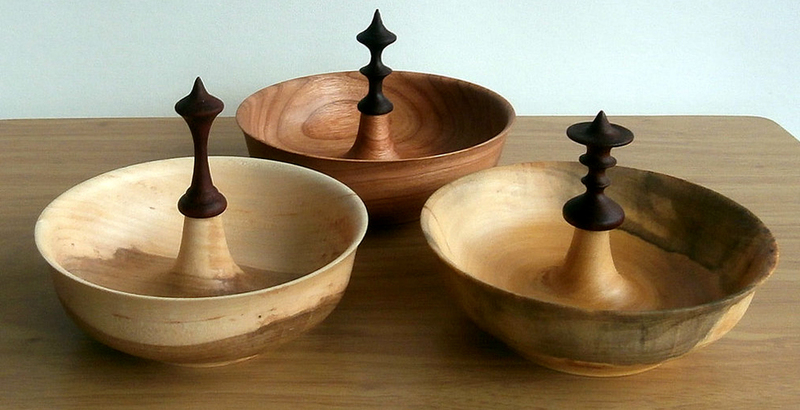 Their primary technique involves wood turning using a lathe and different shaping tools. At a basic level, they spin raw wood, often recycled to be mindful of the sustainability of their natural resources, and then carve or smooth until the desired form is achieved. It sounds simple, but watch them in action, and you'll see how much skill and vision is required. In the category of home goods, Terry and Sarah make everything from goblets to trinket bowls to beer taps and more. They also specialize in toys, recognizing the benefits of all natural playthings that inspire creativity. Some of their most common creations include wands, tops and cars. I appreciate how these two take each cut of wood and consider what they can bring out of in terms of color and grain already inherent in the piece. Many of their works are left natural or finished with oil to celebrate the beauty. Others are painted or decorated with pyrography for added embellishment. Many of their pieces have a quirkiness you'd expect from proud Austinites. You can find these two at arts festivals all over Central Texas. Keep your eye out for new designs coming all the time, and feel free to reach out for commissions of custom pieces.